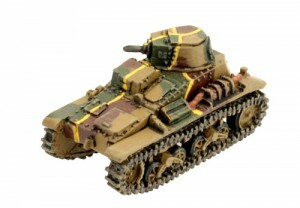 Flames of War is featuring another unit for Flames of War on their website. This time it's the Type 94 TK. The Type 94 TK (an abbreviation of Tokushu Keninsha or Special Tractor) was the Japanese answer to the tankette fad that swept Europe during the 1930s. After testing the British and French designs, the Imperial Japanese Army (IJA) considered the designs too restrictive due to their small size and set about designing a larger version. The Type 94 was based on the British Carden-Loyd Mark VIb tankette and featured a hull of riveted and welded construction. Armed with a single machine-gun mounted in the turret located to the rear of the vehicle. The Type 94 was intended as an infantry support vehicle; providing fire support when needed and carry vital supplies to the frontlines. However, like most tankette designs of the period it lacked any significant level of armour protection which meant the vehicle was vulnerable to virtually any form of enemy fire. For example, the American .50 cal machine-gun could penetrate the Type 94 from 600 yards. Despite this, the Type 94 stayed in production well after it was considered obsolete mainly due to its low production cost.